After I forwarded the email to my assistant so that he could send out the meeting request to the group, he laughed and then apologized for laughing. When my coworkers started trickling out of the office around 3pm, a couple of them asked if I wanted to grab a drink before heading out for the weekend. Obviously, I had to decline. Around 4, as the last of my coworkers left the building, they teasingly asked why I was still there. Didn’t I know it was time to go home? Even my assistant bailed on me at 5pm while I was dialing the moderator passcode to begin the conference call. Friday at 5pm before a three-day weekend and my office was deserted except for me, and I had no one to blame but myself. Now, if I’m being honest, it wasn’t that bad. While it was happening, I was jealous of everyone who’d already left. But, the call ended up being fairly quick. 45 minutes later, I was sending off the last of the emails to make sure everyone had a summary of what we discussed, along with the action item list. By 6pm, I was walking to the metro, and my long weekend was underway. When I walked in the door around 6:45pm, Hubby had pork chops defrosting, and I was ready to open a bottle of red to kick things off right. The 2012 Bouchaine Vineyards Estate Pinot Meunier (winery) is from Carneros in Napa Valley, California. The wine had a medium ruby color. On the nose, there were pomegranates and cranberries mixed with hints of allspice. In the mouth, there were pomegranates, cranberries, pine needles, and earth, along with hints of cinnamon and black olives. The wine had a medium body, medium acidity, and medium tannins. Finding a Pinot Meunier is a little unusual, as the grape is usually used as the third variety (along with Chardonnay and Pinot Noir) in traditional, French Champagne. Only a handful of wineries make a stand-alone red wine out of the grape, and Bouchaine happens to be one of them. They produced only 600 cases of the 2012 vintage. 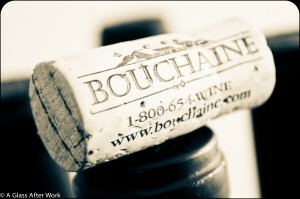 It’s a great varietal wine because it has nice flavors and is medium bodied, without being overly acidic or tannic. Is this wine worth a glass after work? Definitely! If you see this wine in the store, grab it; you won’t be disappointed. At $40 a bottle (or $32 a bottle for wine club members, and this is one of my three wine clubs), this wine is a little expensive for an every day wine, but it’s also a little different and is beautiful to drink, particularly when it has time to breathe. For me, it’s a “Friday” wine…a wine that I can open up when I get home, taste and make my notes while Hubby prepares dinner, sip throughout dinner, and then savor for the rest of the evening, as Friday nights tend to be later nights in the A Glass After Work household because we don’t have to worry about getting up for work the next morning. The wine paired beautiful with Hubby’s pork chops, which he breaded in salt-pepper-garlic-and-oregano seasoned panko breadcrumbs and baked. 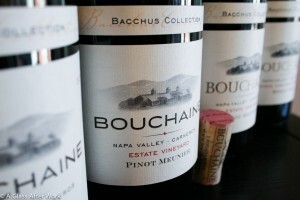 The meal was simple, as our only side was applesauce, but when paired with Bouchaine’s Pinot Meunier, it absolutely sang. The wine was a great alternative to Pinot Noir, which is what I usually tend to pair with pork chops. P.S. If you haven’t filled out my reader survey yet, please do so. It’s only 10 questions (9 multiple choice questions and 1 “anything else you want to tell me”). I’d love to hear from you about what you like and what you would like to see more of at A Glass After Work! Question of the Day: Do you tend to drink wine, beer, or something else with your pork chops?